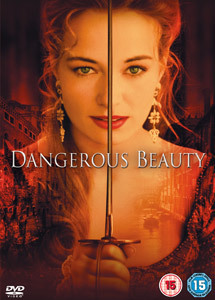 Dangerous Beauty tells the story of a 16th century Venetian poet, Veronica Franco, who becomes a courtesan after realizing that she isn't satisfied with the prospect of an arranged marriage. Ladies weren't educated, but courtesans could read and write, and as a poet, Veronica was determined to maintain her right to do so. The costumes in this movie are absolutely beautiful, and the acting is excellent, too. Catherine McCormack is strong yet vulnerable, subtle and witty in her portrayal of Veronica. I'd never thought of Rufus Sewell as a romantic lead, probably because I've usually seen him as an elegantly sneering villain, but he was charming as Marco Venier, Veronica's first love. The storyline was wonderful and compelling, but what really took my breath away about Dangerous Beauty was the costuming. There are so many layers and textures and details to look at that I found myself pausing the movie just to try to absorb it all. The courtesans' costumes were particularly spectacular. Dangerous Beauty was based on the biography of Veronica Franco, The Honest Courtesan, by Margaret Rosenthal, which I'd love to read, probably over the summer. The movie is available to watch instantly on Netflix-- if you watch it, I'd love to hear your thoughts! I loved this film- in Australia it's known as 'A Destiny of Her Own' - I love history and costume, so of course, I loved it. The poem at the start is so poignant- and I wrote all of Veronica's down (except for the poetry duel) in a little book I keep for poems, song lyrics and inspirational quotes. Did you notice the guy that puts her on trial, is the same guy from 'Braveheart', that puts her on-screen husband William Wallace (Mel Gibson) on trial? The woman that played Livia was Melina - last name starts with K and is kind of long; she was in one of the Law and Order series- recently she played Athena in 'Percy Jackson'. Guilia Valetzza was played by our own girl, Naomi Watts- quite famous now, so I got a bit of a shock when I first saw it. And, I had a massive crush on the guy who played Ramberti- there was just something about him and his portrayal.